Editor's Note: CHANGING TIMES, a regular feature of WHOOSH!, examines episodes of the internationally syndicated television show, XENA: WARRIOR PRINCESS (this month, BEWARE OF GREEKS BEARING GIFTS #12, ATHENS CITY ACADEMY OF THE PERFORMING BARDS #13, and A FISTFUL OF DINARS #14), and considers the changes happening individually and between the two characters, Xena and Gabrielle, along with discussing the clues offered in each episode about their pasts. Xena and Gabrielle have a spirited difference of opinion while Perdicas looks on. In GREEKS, Xena goes against her own countrymen to help an old friend whom she had parted with previously on bad terms, and Gabrielle changes how she thinks about her once-betrothed, Perdicas. Xena about to dismember an expendable extra. Xena is not thinking even remotely about visiting Troy until she sees and attempts to save a man being attacked on the road. The man is a servant of Helen of Troy, bringing a message that Helen needs Xena's help. We learn later that although Xena and Helen left each other on poor terms the last time they met, they were still friends. 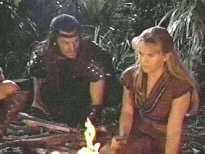 Since we have never seen Helen before this episode, we must assume that they were friends before Xena turned good, or during the time she was good before SINS OF THE PAST (#01). Thus Helen, kind of like Marcus, is most likely a friend Xena made when she was evil, but is still friendly towards now that she is fighting for good. Apparently, Xena is loyal enough to her friends that she even is willing to fight to get to them and then fight against her own countrymen to further assist them. When Xena finds Helen, Xena hugs her. Xena, who hardly lets anyone near her, let alone hug her, is comfortable enough around Helen to let her get that close. Xena shows off some interesting sides to her personality during this episode. First, Gabrielle is getting nervous about running through a war zone to get to Troy. Xena says, "Are your boots laced?" right before dashing off. What a way to distract a person from their fear! Second, once inside and ready to go find Helen, Perdicas mentioned Xena should see Deiphobus first. Not knowing if that name was male or female, she asks, "Who's she?" and assumes the unknown person is female rather than male. Xena shows here that she does not think being a female warrior is at all limited to herself and seems also to expect more of them. That or she is giving Perdicas a hard time. Third, when Xena finds Helen, she refuses to take her back to King Menelaus. 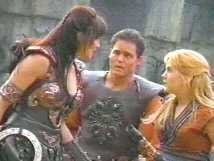 Instead, Xena tries to get Helen to leave, since the war stopped being about Helen. Leave it to Xena to see when a war's cause has turned into an excuse and it is time just to leave if you do not like it. Again, Xena encourages Helen to go out and be and do what she wants instead of letting others run her life. Though Xena was her usual creative and quick-thinking self, she did something rather surprising. When the guards try to capture Xena, and Deiphobus is holding a dagger near Helen's back, Xena allows herself be captured despite the fact she knows something is not right and she does not know for sure that she can get free. Impossible odds have never stopped Xena from freeing a person before, so why did she let the guards take her? It seems like whenever the person in danger is someone she really cares about, she freezes some or gives up, like her chakram was too late to save Marcus in THE PATH NOT TAKEN (#05). Is this Xena's 'fatal flaw'? For those people who think Xena never gets frightened, take a look at her face when she is in jail and the big Greek just stepped into her cell. Xena looks frightened, but that does not stop her from then smiling and looking like, if not really, enjoying the fight. Finally, we learn a little bit more about how Xena thinks of Gabrielle. When Perdicas thanks Xena for taking care of her, she replies, "It's no problem, she's like family." Gabrielle about to disable an expendable extra. Gabrielle shows off her courage and loyalty once again. Xena decides to go to Troy during a war? Of course, Gabrielle is right beside her even though she is scared. Xena is going to fight against the Greeks for a while? That means Gabrielle follows the lead. Gabrielle really trusts Xena's judgement by this time. Gabrielle also shows off her romantic side in this episode. It starts off when she wants to stop by Troy because Helen, 'who launched a thousand ships' was there. Forget the fact these were warships. When Gabrielle finds out that Perdicas is fighting at Troy because it is a 'war for love,' she says he is doing that because she told him tales, and she takes the responsibility for making war seem romantic. We learn quite a bit about Gabrielle through her interaction with Perdicas. We find out that when they were young, Gabrielle used to boss Perdicas around. Not only that, but Perdicas would take the blame for things Gabrielle did. He even was slightly accident prone in his efforts to please Gabrielle. So when Gabrielle hears he is fighting this war because it is a war for love, she tells him to go home before he gets hurt. Which he refuses to do. Perdicas said the last thing he saw of Gabrielle was her leaving town. She left town in the middle of the night, but Perdicas saw her leave. I get the feeling that he saw how she reacted to Xena and, knowing her, thought she might leave. Even learned that Gabrielle does not respect men that let her boss them around. That might have been half the reason why he decided to leave farming and become a soldier. Gabrielle sees that Perdicas is now confident, good at fighting, and deserves respect. That is when she starts to fall in love with him again. Gabrielle did not say goodbye to Perdicas when she left the village. She did not thank him for always taking the blame for her or seem to really ever think about his feelings at all. Now she thanks him for taking the blame so long ago. She listens to him when he tells her to take cover, then is impressed by how well he handles himself in the fight. She does not even complain to Xena about being left behind when Xena tells her to stay behind with Perdicas. When the Greeks about to break into the temple, Gabrielle goes so far as to say she is sorry about how she treated him and kisses him. In the end, though, Perdicas decides he is not ready to give up his new freedom. Gabrielle sort of stops and mutters that she was going to say the same thing, but had seemed ready to say something else before Perdicas said his words. Gabrielle even lets Perdicas kiss her one last time. Even Xena makes the comment she thought Perdicas was going to join them, but Gabrielle mumbles "no" in response. Bards, in their natural habitat. Xena learns that Gabrielle might not always be at her side while Gabrielle tries to find out if she can really obtain her dreams. Xena appeared more in flashbacks than not in this clip show episode. [15 ] Gabrielle learns about a bard contest when Xena comes back. 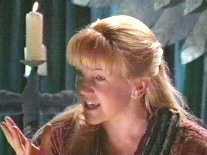 Xena tells her about some monster causing havoc and asks, "I guess I don't have to ask if you want to come along, huh?" Then Xena learns that Gabrielle is willing to leave her for four or five years in order to follow her dream to become a trained bard. Xena, though sad, tells Gabrielle a story to get across that Gabrielle is like family to her, then lets Gabrielle go. Xena even tells her to follow her dreams and that she WILL win, because she is a good story-teller. We learn that Xena, though sorry to lose Gabrielle, is willing to let her go and that she now has confidence in her skills. The bard makes a point. The episode starts with Gabrielle telling stories about the adventures she has had with Xena. Now we know it is Gabrielle who is recording and telling these adventures for future generations to come. Also, people pay her money after her story- telling. This is one of the ways Xena and Gabrielle get money since they do not fight for money. Gabrielle is irritated enough by Orion's father and tantalized by the chance to become a trained bard, that she is willing to leave Xena for a time. It seems strange that Gabrielle would do that, but it is a dream of a life-time versus her pride against a short absence away from her friend. So she leaves Xena, tricks her way into the contest, and immediately makes several friends among her competition. At the introductory lecture, Gabrielle gets a feeling that something strange will happen even before it does. It shows how much she has picked up from Xena. Not only that, but she stands up to the lecturer when she thinks what he is saying is not good advice on story-telling. Several times Gabrielle makes the point that she thinks that stories should have morals. Later, Gabrielle is taking to her friends in their room. They look to her for advice on how to tell stories better, even though she is a contestant with them. Gabrielle is just observant enough to see what is wrong and is able to give good advice, so they are smart to listen. They listen to her defend Xena and believe her, too, despite having heard of Xena's evil reputation. Her friends come to respect her enough that they are willing to give up their own chance at the Academy so that Gabrielle can stay in the competition. Gabrielle even tries to keep them from getting into trouble over helping her, but they will not have it. Perhaps why Gabrielle tries to stop them is because Gabrielle is not used to attention, especially with Xena around. When everyone starts gathering around to listening to her stories at the beginning, she comes out of the story and seems self-conscious of all the people standing around. Gabrielle also learns the pros and cons of adventuring versus being a trained bard. She wonders what Xena is doing and misses the excitement of adventuring. She also does not like having to meet and then leave so many of the friends she has made along the way. Also, she wins a spot in the Academy, but in the end she learns that her real dream, or her new dream, is to be living the adventure rather than just telling stories about it. "This is a story of two friends. They met each other in the hardest of times. They learned to care for each other. They became a great team. Some adventures ended better than others. And together they learned life's mysteries." A beam of light shows the way. In FISTFUL, Xena learns that other people she thought she had figured out could change and Gabrielle learns that there are more subtle dangers than the obvious ones. Xena about to show she can throw more than just a chakram.. The episode starts out with Lycus, an old friend of Xena's, getting killed for his clue to the Summerian treasure. Again, we never have met Lycus before, yet two people who knew him (one of them Xena) say that he was a good man. Also, only Lycus and Xena knew that the Titan's Key, hidden with the Summerian treasure, lead to ambrosia. Both of these facts seem to indicate that Xena met Lycus after she turned good. If she knew about the ambrosia when she was evil, she probably would have tried to get it. Also, Lycus was a good man, so Xena would have been less likely to know him when she was evil. Also, we may have another hint of what she did between UNCHAINED HEART (H#13) and SINS OF THE PAST (#01). We also learn some small things about Xena. First, she is a quick reader and can memorize things even quicker. 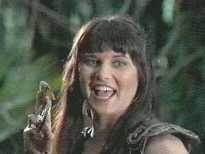 Next, Thersites notices that Xena does not have 'that gold fever,' so questions why she is along. Either Xena did not notice she had changed that much, or she makes a mistake in not acting greedy. The assassin takes the knowledge she is not in it for the greed and uses it to figure out how important the Titan's Key is. Another interesting thing is that the Thersites and Petracles both obey Xena's commands. It is probably because she is not greedy and therefore they feel like they can trust her to keep her word. Still, they both immediately let her become the leader of the group, and even let Gabrielle come along as part of the group because of her. Wherever Xena is, she has the personality that dominates and takes command like it was always hers and others fall into letting her have it. Most importantly, we see how Xena deals with Petracles, who she almost married once. Xena is distrustful of him because of the way he won her, then dumped her. She warns Gabrielle against him, and even refuses to consider he might have changed because of her very strong past impressions of him. Basically, she lets her past blind her to the differences that are there. In the end, Petracles gives his life to save Gabrielle. He hands Xena her wedding bracelet that he has keep over these many years. Then, finally, Xena admits that he had changed and she was sorry she ever doubted him. Gabrielle feeling the heat of more than just the campfire. Gabrielle does not pay attention to Xena's advice very well in this episode. She talks to Petracles despite Xena's warnings against him. She says that he is funny and she would give anything away, she is 'an adult, after all.' Gabrielle cannot see the evil man Xena can, and in part that is because Gabrielle is seeing the real Petracles while Xena is seeing the past Petracles. Also, Gabrielle has always been drawn in by men who like to talk and treat her as an equal. Of everyone in group, only Petracles was doing that. Gabrielle is also interested in Xena, and Petracles holds a very large clue to Xena's past. All of this serves to draw Gabrielle to Petracles despite Xena's warnings. We also learn a few more things about Gabrielle. She used to have a pony when she was very young. So why is she afraid of riding Argo? In CHARIOTS OF WAR (#02), she responds to the suggestion of riding with, "not until they make those things closer to the ground." Also, Gabrielle was used to a pony, not a warhorse like Argo. The fact that Argo is trained to fight and is tall may be what intimidates her. Gabrielle also did not have her staff the entire episode. At the beginning, she even was ready to use her bag as a weapon since she did not have a staff. Why would she be without her one weapon, especially when their companions were as dangerous as their enemies? Why didn't Xena make sure she had her staff? I could understand Xena not wanting Thersites and Petracles as seeing her as a threat, but Gabrielle did not even have the staff at the very beginning. Even without her staff, Xena sends Gabrielle into the temple with Thersites to talk their way into getting the gem. Gabrielle pulled her weight even without being able to help fight.